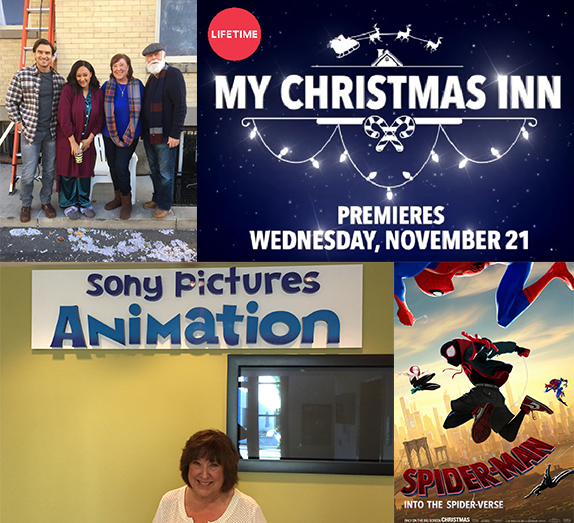 LOS ANGELES (November 15, 2019) – Actress MELANIE HAYNES delivers plenty of fun this holiday season appearing in Lifetime’s TV movie, MY CHRISTMAS INN, and then in theaters with Sony’s animated Marvel feature film, SPIDER-MAN: INTO THE SPIDER-VERSE. Haynes will head back to the small screen in 2019 when she emerges in season three of HBO’s anthology crime drama TRUE DETECTIVE. On November 21st, Haynes joins the festivities as Ruth in the Lifetime holiday movie MY CHRISTMAS INN. The story follows Jen Taylor (Tia Mowry-Hardict), who inherits a cozy Alaskan inn and unexpectedly discovers a spark of love with small town attorney Steve Anderson (Rob Mayes). Ruth (Haynes) and her husband are regulars at the Inn who demonstrate to Jen just how fulfilling a loving relationship can be. Then hitting theaters on December 14th, Haynes lends her voice to the Marvel Universe for the new Sony animated feature film SPIDER-MAN: INTO THE SPIDER-VERSE. Spider-Man crosses parallel dimensions and teams up with the Spider-Men of those dimensions to stop a threat to all reality. Haynes joins the action as the Logic Teacher alongside the all-star cast including Nicolas Cage, Hailee Steinfeld, Liev Schreiber, John Mulaney, Mahershala Ali, Lily Tomlin. Coming in 2019, Haynes heads back to the small screen for the anticipated season three of HBO’s anthology crime drama series TRUE DETECTIVE, premiering on January 13th. The next installment tells the story of Wayne Hays (Mahershala Ali), a state police detective tasked with investigating the disappearance of two young children in the Ozarks. Haynes joins the cast that also includes Carmen Ejogo, Stephen Dorff, Ray Fisher, Sarah Gadon and Rhys Wakefield among others. Haynes has landed in several celebrated indie films, including as the awkward Aunt Patty in the comedy Antiquities, starring Andrew J. West, Ashley Green, Mary Steenburgen and Michaela Watkins; and as Aunt Trish in the new digital buddy road-trip comedy release Chasing the Sun. Her film roles also include Mother of Mackenzie Davis in the coming-of-age drama, A Country Called Home; as a Church-going, pyramid scheming deceitful woman in Heartland; as the charming but lonely Southern belle Cordella in the award-winning short Tender Moments; and as the no- nonsense bar owner Sissy in the indie drama The Last Mark. Splitting her time between Los Angeles and her hometown Houston, Texas, Haynes has appeared in and voiced numerous television projects, most recently as a Southern Chef opposite Adam Conover in TruTV’s Adam Ruins Everything. Her TV credits also include The Middle, Salem, A Face to Kill For, The Con, Arrest & Trial and The Daily Apple. She earned her Bachelor’s degree and teaching certificate in Theater and English at the University of Houston, and danced for several years with Patsy Swayze’s Houston Jazz Ballet Company. Haynes served on the board of SAG-AFTRA’s Houston Local Branch for 15 years and as the President for two terms. Today, Haynes continues to run her own professional voice over studio which she established back in 2002. Melanie Haynes is represented by Aqua Talent, Caviar Enertainment, Osbrink Agency (VO), Pastorini-Bosby Talent (Houston/SE) and Stars Talent Studio (Utah).